We’re excited to invite you to join in on our new language-learning activities that we're offering on Viki! As you’ve seen with our recent blogs “Learn These 5 Chinese Phrases” and “Learn These 5 Thai Phrases,” it’s actually easy and fun to start learning a new language. If you start slowly by memorizing just a few phrases and practicing pronunciation, you’ll quickly be on your way to learning a whole new language. Starting with this blog, we'll give you challenges and quizzes that will earn you points for participating. And the best part is that the more points you earn, the better chance you have for receiving gifts! Thanks to Tuttle Publishing, some of the sponsored book gifts include “Korean for Beginners,” “Chinese for Beginners,” and “K-POP Now! : The Korean Music Revolution.” If you’re interested in other books offered by Tuttle Publishing, take a look at its complete catalog. Here are your first set of challenge questions in Korean! You can submit your answers in this survey. Jae Wan (played by Lee Dong Wook) comforts Mo Ne (played by Lee Da Hae) by saying “괜찮아 [Gwen-chan-ah].” Did he mean to say “It’s okay” after she is frightened by a scary sight? Check out the Language Learning category in Discussions to continue this conversation! Interact with fellow community members on interesting topics, such as tips/advice for learning a language, common challenges and solutions, and recommended resources/tools/websites. Keep up with our language-learning activities on Viki, and we’ll have you speaking and understanding several languages in no time. And be on the lookout for our next language-learning challenge! Last week, we kicked off the World Cup in Viki fashion by creating a celebrity bracket where you can vote on your favorite drama stars! For each match, the celebrity who gets the most votes will move on to the next round. Remember to cast your votes early so your favorite doesn't get cut! We will show a different celebrity pairing for each week of #WorldCup2014. By the end, there will be a final vote to see who is chosen as your overall favorite drama star! The first match featured Drama Leading Ladies, Puff Guo (from Love Myself or You) vs. Lee Da Hae (from Hotel King). Who is your favorite young male hottie? Which handsome leading actor will join Puff Guo in the next round? Vote and tell us in the comments too! 06/19/14--12:09: Enter to Get a Signed ‘No Tears for the Dead’ Poster! Enter for a chance to get this poster signed by Jang Dong Gun! It’s time for another giveaway! We have one “No Tears for the Dead” movie poster, autographed by Jang Dong Gun and Kim Min Hee, that we’re giving away to one lucky Viki community member! The new action thriller is about a man named Gon (played by Jang Dong Gun), who was abandoned by his mother after immigrating to the United States and raised by the mafia. He grows up to become a cold-blooded hit man who usually is meticulous in taking out his targets. But when Gon makes a terrible mistake during one of his assignments and accidentally kills an innocent little girl, he is overcome with guilt. What will he do when his boss then asks him to kill the young girl’s mother (played by Kim Min Hee)? The exciting new South Korean film will be released in North American theaters on June 20! Check out the official movie webpage for a complete list of available theaters and showtimes. One lucky person will be chosen and contacted by Direct Message on Twitter on Thursday, June 26, Pacific Time. If chosen, you must reply with your mailing address by Sunday, June 29, Pacific Time, or another person will be chosen. Don’t miss out on this exciting giveaway! Get those entries in! 06/20/14--13:42: Celebrate Lee Min Ho’s Birthday With His 5 Best Kiss Scenes! Happy early birthday to one of the most beloved actors in the world — Lee Min Ho! He turns 28 on June 22. We’re celebrating his birthday with a recap of our favorite Lee Min Ho kissing scenes from each of his dramas, which are just one of the many reasons we’ve fallen in love with this actor! So pucker up and enjoy these great Lee Min Ho kissing scenes! Jun Pyo (played by Lee Min Ho) is in the car with his cruel and conniving mother, who has forbidden him from dating Jan Di (played by Gu Hye Sun). Jun Pyo’s intentionally has her driver pass by the place where Jan Di and her family are selling snacks on the side of the road. Ignoring her anger and disapproval, Jun Pyo gets out of the car, walks right up to Jan Di and kisses her in the middle of the street for everyone to see. Afterwards, they take a walk and Jun Pyo makes Jan Di promise that if anything happens, she’ll let him know, and that she won’t run away from him. Aww! Kae In (played by Son Ye Jin) storms out in the middle of a musical and tells Chang Ryul that she can’t do this anymore; she only dated him so that she could exact revenge for the hurt he caused her. Chang Ryul says that it’s okay because he knows he can make her like him for real, but Kae In says it’s impossible ... because Chang Ryul doesn’t know who has her heart. Overhearing this, Jin Ho (played by Lee Min Ho) strides over, grabs Kae In and says “It’s game over,” and kisses her passionately. After the kiss, Kae In is obviously confused because she still thinks that her former roommate Jin Ho is gay. Jin Ho confesses that he’s straight (finally!). Gae In gets justifiably angry, but she puts her anger on hold as she hugs him. Yoon Sung (played by Lee Min Ho) has another nightmare where he’s unable to save Na Na (played by Park Min Young), and he decides that he needs to see her right away to make sure she’s okay. At her apartment, Na Na also is tossing and turning with worry about Yoon Sung, so she goes to the roof to get some air. Yoon Sung shows up and angrily asks her why she’s out alone at 2 a.m. She returns his anger, asking why he makes people worry by not answering his phone. Rather than continuing this lover’s spat, Yoon Sung interrupts her with a kiss. It’s bittersweet because Yoon Sung will soon leave Na Na in an effort to protect her. In order for Choi Young (played by Lee Min Ho) to rescue Eun Soo (played by Kim Hee Sun) from a royal wedding, he kisses her in front of her would-be husband and other officials. This unexpected kiss is their first and only kiss in the series. Starting with this moment, the chemistry that had been building between this popular noona/dongsaeng (older woman/younger man) couple finally starts to turn into something more. Eun Sang (played by Park Shin Hye) has made a deal with the chairman, Tan’s father. Rather than forcing her to leave immediately, he will let Eun Sang spend two more weeks with Tan (played by Lee Min Ho). But after two weeks, Eun Sang must get on a plane to a location of the chairman’s choosing. When Tan gets a hint of this situation, he’s terrified that Eun Sang will leave without letting him know, so he asks Eun Sang to meet him with her passport in hand. When she arrives, he takes the passport away from her and pulls her into the storage closet. He tells her not to go and kisses her desperately. We’d say this was the most intense Lee Min Ho kiss to date! Which of these kissing scenes is your favorite? Do you have another favorite Lee Min Ho kiss? Let us know! And happy birthday to the “heir” of Asian cinema! Some of you may watch a drama and actually follow the storyline and the plot twists. But if you’re like me, you get distracted by random tangents with the characters and situations. Take “Cunning Single Lady,” for example. You may have thought this very popular show was about a woman’s journey toward self-empowerment and a couple’s second chance at love. But if that’s all you got out of it, then you missed out on a whole subliminal level of important life lessons. You sometimes have to break valuable electronics to get someone’s attention. You can show up to anywhere unannounced — as long as you bring beer. The richer you are, the bigger your sunglasses need to be. When you’re rich, servants greet you at the door to take your shoes off. If you’re lucky, someone rich will give you a white envelope full of currency with lots of zeros on it. If you do anything in front of a parked car in Korea, your actions will be caught on the car’s black box and will be used against you. But if you’re ever caught, you can get down on your knees and grovel and all will be forgiven. You can make any mistake once — but not twice! Whether you’re celebrating an anniversary or looking at your ex-wife while she’s passed out drunk, it’s always a great time to take a selfie. It’s great to have a passcode lock on your front door so you can lock people out whenever you feel like it. You can be talking about the same woman with a friend but never realize it because Korean people don’t ask for names! That’s 10 p.m. — not 10 a.m. — and yes, you’re still at work because that’s where you should be if you want to get ahead in life. When you least expect it, there will always be that creepy guy at work staring at you. There will always be treacherous ‘seniors’ at work giving you words of wisdom about surviving a treacherous workplace. You can eat a bell pepper like you do an apple, but it won’t be as sweet. You can give someone tofu to ward off bad luck — especially after a brush with the law. You can put an egg on a person’s rice to show the person that you like him/her. Your ‘friends’ will always try to one-up you and embarrass you at group meetings. You’re never too old to cuddle and sleep with your mom. You can put a dorky wig or funny-looking hat on Joo Sang Wook, but he’s still hot. What part of “Cunning Single Lady” was your favorite? Let us know in the comments below! 06/23/14--10:00: Get the Limited Edition World Cup Sub-a-Thon Badge! Join in on the worldwide excitement for the 2014 FIFA World Cup with our World Cup Sub-a-Thon! Taking part is super easy: create at least 1,000 subtitles during the World Cup (June 10, 2014, to July 13, 2014) and you’ll receive this limited-edition badge to proudly display on your profile page on July 14! 1) Watch the subtitling tutorial video on our Viki U Channel. 2) Find a video that needs your help in the Project Finder and get started. It’s that easy! Also, make sure to check out Community Discussions to get to know other Viki community members. We recently announced the start of our new Language-Learning Challenges to show how easy and fun it can be to learn a new language. We’re so happy to see such great response to the book gifts sponsored by Tuttle Publishing! The answers to last week’s challenge questions in Korean from the drama “Hotel King” were both True. For the first question, when Jae Wan (played by Lee Dong Wook) says, “괜찮아 (Gwen-chan-ah),” he was comforting Mo Ne (played by Lee Da Hae) by saying, “It’s okay,” while patting her head. For the second question, Jae Wan yells, “미쳤어 (Mi-cheo-ssuh)?” at Mo Ne, saying “Are you crazy?” when he found out she helped release Lee Joong Go (played by Lee Duk Hwa) from jail. Hope you got them both correct! Now, here is the next set of language-learning challenge questions in Chinese! Both of these questions relate to one-liners spoken by Du Kai Qi (played by Puff Guo) in “Love Myself of You.” You can submit your answers in this survey. 1. Kai Qi says “你要听我的 (Ni yao ting wo de)” while drying off Xiao Yi after giving him a bath. a) You must support me! b) You must listen to me! c) You must stop me! 2. Kai Qi says “别想我会放水 (Bie xiang wo hui fang shui)” to Ah Jie (played by Jasper Liu) during their discussion about training for the upcoming cooking competition. a) Don’t even think that I’ll be going easy on you. b) Don’t even think that I’ll be putting water on the floor. c) Don’t even think that I’ll forgive you. Keep the conversation going in Discussions on Language Learning topics such as “Words and phrases learned from watching dramas and movies” and “Languages you already know or want to learn”! Remember, you earn points by submitting these Language-Learning Challenges, and the more points you earn, the better your chances of winning book gifts sponsored by Tuttle Publishing! Continue following our Language-Learning Challenges on Viki, and we’ll have you speaking and understanding several languages in no time. Be on the lookout for our next challenge so you don’t miss out! If you haven’t already, be sure to take our first Language-Learning Challenge in Korean! It's Week 3 of the World Cup, and we have another celebrity bracket ready for you to cast votes on your favorite stars! For each match, the celebrity who gets the most votes will move on to the next round. Remember to cast your votes early so your favorite makes the cut! The first match featured Drama Leading Ladies, Puff Guo (from "Love Myself or You") vs. Lee Da Hae (from "Hotel King"). Last week, we featured Young Male Hotties with Mario Maurer (from "The Dog" and "To Each a Flower") vs. Jasper Liu (from "Love Myself or You"). You all voted for one handsome leading actor to move on to the next round. So who received the most votes? 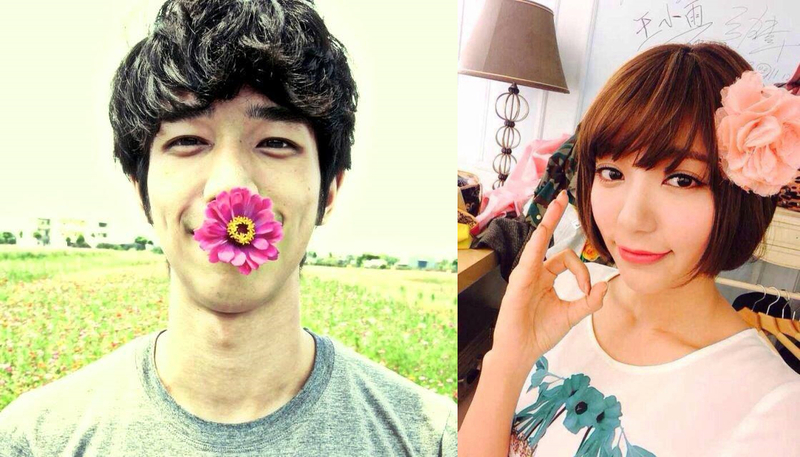 Let's say congratulations to... Jasper Liu!! The results were 55% to 45%. He gets to join his beautiful co-star, Puff Guo, who received the most votes during Week 1.
Who is your favorite Telenovela queen? Which Mexican beauty will join Puff Guo and Jasper Liu in the next round? Vote and share your picks in the comments too! 06/27/14--04:00: You + Favorite Celebrity = Best Summer Vacation! If you could pick any celebrity, who would you choose to bring along on your summer vacation? Maybe Lee Jong Suk, Kim Hyun Joong, or Aaron Yan? How about Puff Guo, Song Ji Hyo, or Lee Min Jung? The possibilities are endless, and we know picking just one is heartbreaking. This might help make your decision easier. Imagine yourself doing the following summertime activities and see which celebrity would be the ideal mate to share the experience with! Not only is biking like Annie Chen and George Hu in “Love Around” great exercise, but it’s also an inexpensive way to get around. You never know where you might end up! In addition to getting a tan, there are lots of fun activities to do at the beach, such as parasailing, windsurfing and riding ATVs. Check out Choi Min Ho and Choi Sulli in “To the Beautiful You” as they cruise on the sand. Don’t you wish he would offer to help you, too? Yes, please! It’s finally time to decide. … Which favorite celebrity would you choose to accompany you during your summer getaway? Let us know the celebrity and the activity you would choose in the comments! 06/29/14--05:00: 5 Reasons Birthday Girl Puff Guo Can’t Be Ignored! Today, we officially celebrate a quarter century of life for rising Taiwanese star Puff Guo! With recent success in “Just You” and “Love Myself or You,” she’s become high in demand as a drama leading actress. All of you even voted for her to move on to the next round of our Viki #WorldCup2014 Celebrity Bracket in a tight race against Lee Da Hae! We absolutely adore Puff Guo, and there’s no stopping her as she rides this wave of increasing popularity. Check out these five reasons why she continues to get even hotter and hotter! In April 2011, Puff debuted as a member of Taiwanese girl group Dream Girls. Her fellow members include Emily Song, who is Korean, and Tia Li, who is Taiwanese and currently starring in “Fall in Love With Me” with Aaron Yan. For both 2013 and 2014, Puff received the most votes to top the list for FHM Taiwan’s 100 Sexiest Women in the World. She beat out heavy favorites, including Amber An, who held the title in 2011 and 2012. In “Just You,” Qi Yi (played by Aaron Yan) decides to buy a small marketing design company and his childhood home. The problem is that the home is currently being rented by Cheng Liang Liang (played by Puff Guo), who refuses to move out. When Qi Yi arrives at his new company, he discovers that Liang Liang works there, too! In “Love Myself or You,” Du Kai Qi (played by Puff Guo) is an independent, single woman who is passionate about her job as a sous chef at fine-dining French restaurant, Figaro Cuisine. Fu Zi Jie (played by Jasper Liu) shows up as the new intern, while hiding the fact that he’s a classically trained chef who just returned from France. Starring as Heechul’s (from “Grandpas Over Flowers Investigation Team”) partner in “We Got Married Global Edition Season 2,” Puff is slowly becoming well known outside of Taiwan. On the show, Puff and Heechul learn to overcome their language barriers and enjoy a variety of activities as a newlywed couple. With newfound fame in Korea, maybe Puff will venture into Japan or Thailand next? Puff had a difficult and sad childhood, with the early passing of her mother from breast cancer. To support her younger sister, she started working as a model at age 20 and gave up on her academic study. It’s great to see that all her hard work paid off — go girl power! What do you love most about Puff? Let us know in the comments! 07/02/14--13:50: 3 Reasons Not to Miss ‘Fated to Love You’ Korean Remake! A popular trend these days in the drama world is remakes of hit shows from other countries. Did you know that "It Started With a Kiss" from Taiwan moved to Korea with “Playful Kiss” before making its way to Japan again with “Mischievous Kiss: Love in TOKYO”? Now, we’ll see how Korea’s answer to Taiwan’s “Fated to Love You” will do with its launch today! Here are three reasons why you should be excited to watch “Fated to Love You (Korean version)”! Ethan Ruan and Chen Xin Yi had magical on-screen chemistry, which helped the Taiwanese idol drama earn the highest TV rating and hold the record since 2008. At the 43rd Golden Bell Awards, “Fated to Love You” was recognized as the Best Television Series of 2008. After playing the lead roles opposite each other in the popular 2002 drama “Successful Story of a Bright Girl,” Jang Hyuk and Jang Na Ra meet again on the small screen for the first time in 12 years in the Korean remake of this much-anticipated new drama. Over the past year, Choi Jin Hyuk has been working nonstop, starring in “Heirs,” “ Emergency Couple,” and “Grandpas Over Flowers Investigation Team.” There’s no rest for him as he continues here, playing the role of Daniel. Wang Ji Won recently completed “I Need Romance 3” and now laces up her ballet shoes again in the role of Kang Se Ra. Did you know she originally debuted as a ballerina with the Korean national ballet group? What are you most looking forward to about “Fated to Love You (Korean version)”? Share with us in the comments! 07/03/14--09:34: Who Will Get a Spot in K-Pop Girl Group KARA? Have you ever wanted to be a famous K-pop idol who gets to travel the world, dancing and singing for fans? If you’ve been following reality show “KARA Project,” you know all about the seven hopeful trainees pursuing their dreams for vying for a chance to join popular girl group KARA! Previously, you were introduced to the seven contestants: So Jin, Shi Yoon, Young Ji, Chae Kyung, So Min, Chae Won and Yoo Ji. The talented hopefuls competed in five missions and voting consisted of 30 percent experts’ vote, 20 percent popularity vote, 20 percent performance-rating vote, and 30 percent global popularity vote. After the five missions, it’s now down to the final voting. Which one has what it takes to be the next member of KARA? Find out in the finale on Viki! If you haven’t seen any of the episodes yet, here’s your chance to catch up. Watch all the performances from the beginning and root for your favorite! Who do you think will make the final cut? Share your thoughts in the comments below! The 2014 FIFA World Cup action is heating up as we’re nearing the finals, and Week 4 of our celebrity bracket is just as hot! The first match featured Drama Leading Ladies, Puff Guo (from “Love Myself or You”) vs. Lee Da Hae (from “Hotel King”). The second match featured Young Male Hotties, Mario Maurer (from “The Dog” and “To Each a Flower”) vs. Jasper Liu (from “Love Myself or You”). Last week, we featured Telenovela Queens, Blanca Soto (from “Eva Luna”) vs. Marlene Favela (from “Wild Cat” and “Passion of the Heart”). You all voted for one Mexican beauty to move on to the next round. So who received the most votes? Congratulations to ... Blanca Soto!! The results were 60 percent to 40 percent. Who is your favorite tall and handsome man? Which charming drama leading male will join Puff Guo and Jasper Liu in the next round? Cast your vote and tells us in the comments too! For the past few weeks, we've tested your language learning with the "Hotel King"True or False Questions and "Love Myself or You"One-Liners. It's been great seeing the huge response and conversations in Discussions! The answers to last week's challenge questions in Chinese were 1. b) "You must listen to me!" and 2. a) "Don't even think that I'll be going easy on you." Hope you got them both correct! We mentioned that participation in these activities will earn points towards gifts such as books from Tuttle Publishing and other Viki merchandise. Participation will be awarded 1 point per challenge while every correct answer will earn an additional point per question. Up to 3 extra points can be earned each week by contributing to the Discussions page topics. Please note that these must be quality comments, not just simple responses. Bonus points will be available for things such as most correct translations and sub-a-thons. Maybe you didn't have enough time to join in recently, but it's not too late to start your language-learning journey with Viki so now is your chance to quickly catch up! Next week, we will have our first Tuttle book giveaway. Only users in the Top 10 ranking will be eligible, with one lucky language learner walking away with a book gift. Continue earning points with this week's Language-Learning Challenge: Round-Up Quiz! The questions will review Chinese, Thai, and Korean - the three languages we've featured so far. There is a bonus point available for up to 5 users who submit the most correct translation for each language. 1. In Episode 6 of "Tie The Knot," Xiao Mei (played by Cheryl Yang) reveals to her client's husband that she had spoken with his fiancée before she decided to postpone their wedding. After hearing this, he blames Xiao Mei and becomes very angry. He yells, "搞了半天倩文要把婚事延后就是你搞的鬼 (gao le ban tian qian wen yao ba hun shi yan hou jiu shi ni gao de gui)." Write the most correct translation for "搞了半天倩文要把婚事延后就是你搞的鬼"and enter your answer in this survey. *Hint: It's similar to the "Dragon Gate" phrase from the previous "Learn These 5 Chinese Phrases With Viki" blog. 2. In Episode 1 of "Doctor Stranger," Park Hoon (played by Lee Jong Suk) sold Wonder Girls' tapes to buy a ring to propose to Song Jae Hee (played by Jin Se Yeon). She calls him crazy because it's dangerous to sell things, especially if they come from South Korea. Jae Hee says, "니가 미쳐도 단단히 미쳤구나! 이딴 것 때문에 그 위험한 짓을 한단 말이야? (ni ga mi cheo do dan dan hee mi cheot gu na! ee ddan gut ddae mae gue wi hum han jit eul han dan mal ee ya?)" Write the most correction translation for "니가 미쳐도 단단히 미쳤구나! 이딴 것 때문에 그 위험한 짓을 한단 말이야?" and enter your answer in this survey. *Hint: It's similar to the answer for the second question in the previous "Hotel King"True or False Questions. 3. In "The Library," Ann (played by Selina Wisemann) discovers a note left by Jim (played by Ananda Everingham) addressed to her inside a library book he had borrowed. He wrote, "ฉันขอบคุณมากสำหรับทุกอย่าง (chahn cawb khun mahk sum rlup took yahng)" to show his gratitude for all her help recommending good books. Write the most correction translation for "ฉันขอบคุณมากสำหรับทุกอย่าง"and enter your answer in this survey. *Hint: It's similar to the "Art Idol" phrase from the previous "Learn These 5 Thai Phrases With Viki" blog. **If you haven't tried it out yet, give the One-Liner tool a shot to test your skills on writing and editing in different languages! Also, remember to keep up with language learning in Discussions and we'll have you speaking and understanding several languages in no time. Summer is finally here! Looking for some ideas on how to fun this summer? Try our Viki Summer Bucket List. We’ve got a special lineup of TV shows and activities just for you. See how many of these items you can complete before the end of summer! Be adventurous! Branch outside of your usual genre by watching a new show. We love the Japanese version (Mischievous Kiss: Love in TOKYO) of the popular manga “Itazura na Kiss.” Check out some of the classic scenes from the show here. Favorite these channels to watch the series once episodes are uploaded! Are ads interrupting your binge watching? Try Viki Pass free for seven days and watch all your favorite shows without any ads! It’s the perfect excuse to spend the weekend on a drama-thon. Get an ad-free experience with Viki Pass and you’ll not only watch shows with no interruptions, you’ll get access to an exclusive array of Japanese movies. Already have Viki Pass? Show some love and gift Viki Pass to someone special! Whether you want to learn Chinese, Korean or Thai, we’ve got the shows and tools to get you started! Learninga new language with Viki can be fun and easy, so give subtitling a try! You also can join discussions with other like-minded fans, learning the language you’d always wanted to learn but never knew where to start! Getting ready for a road trip? Don’t forget to bring Viki along with you! Download our free mobile apps on your device and never miss on-air shows while you’re on-the-go! Love music? Be sure to catch the 25th Golden Melody Awards, Taiwan’s equivalent of the Grammys! A prestigious annual event, the awards program honors Chinese singers for their outstanding work in music during the past year. This year, Jay Chou served as the emcee of the awards ceremony! In the film “Pandaman Heroic Detective,” Chou plays a tough detective who tries to stop a group of villains from creating a brain-control device to take over the world. But how did the Taiwanese singer-songwriter fare under the pressures of hosting? Need another reason to watch? See Hebe Tian, the star of the Taiwanese drama “Bull Fighting,” wow the audience with her vocals at the awards ceremony. This year, the ceremony also marked its Silver Jubilee (25th anniversary)! Check out what some celebrities, such as Jolin Tsai and Jam Hsiao, had to say about this special occasion. Want more? See the pre-award programs “Golden Melody Night,” “Super Music of Golden Melody” and go behind-the-scenes as idols share their feelings right before the announcement of the awards. This content is worldwide except select countries in Southeast Asia. Lee Jong Suk is making quite a mark as a rising star in Korea. Since making his film debut in 2005, the 24-year-old actor has played roles as diverse as a troubled student to a genius surgeon. He won Best New Actor at the 2012 KBS Drama Awards for his role in “School 2013” and is now considered one of the most popular young actors working today. See the journey that Lee Jong Suk has made in his television drama roles that prove why he has become such a hot commodity! This Korean drama marked one of Lee Jong Suk’s first television roles. In the series, he plays a young genius musician we rebuffs a famous Hallyu star’s attempts to recruit him as a protégé. High school can be a tough tumultuous time. Lee Jong Suk, along with fellow classmates played by Park Se Young, Ryu Hyo Young, and Kim Woo Bin try to navigate all the dramas of the classroom. Jang Na Ra and Daniel Choi play teachers who try and lead the troublesome students. You can see the fun trailer below of this drama, which earned Lee Jong Suk his Best New Actor award! Lee Jong Suk plays a 19-year-old student with the special ability to read people’s minds. Together with a sharp-tongued public defender, he tries to help catch a dangerous killer! Lee Jong Suk plays a young man who grew up in North Korea after he and his father are trapped there. He grows up to become a genius surgeon who manages to escape and return to South Korea but must learn how to adjust to his new life there and figure out how to have his girlfriend join him. Watch the trailer below of this exciting drama! Which Lee Jong Suk character was your favorite? Let us know in the comments below! 07/10/14--18:00: Final #WorldCup2014 Celebrity Bracket: Overall Favorite Star! As the World Cup is quickly coming to a close on July 13, we have the final celebrity bracket ready for you to cast your votes! Last week, the match included Tall and Handsome Men, George Hu (from “Love Around” and “Love, Now”) vs. Ji Hyun Woo (from “Trot Lovers” and “Queen In Hyun’s Man”). You all voted for one charming male to move on to the next round. So who received the most votes? Congratulations to ... George Hu! The results were 54 percent to 46 percent. Who is your overall favorite drama star? It’s a tough decision, but we know you can do it! Who do you pick as your overall favorite drama star? Cast your vote and tell us in the comments too! 07/11/14--10:14: 1st Book Giveaway for Language-Learning Challenges! We also announced having our first Tuttle Publishing book giveaway! Only users in the Top 10 ranking are eligible, so here’s a look at the lucky language learners who have a chance to walk away with a book gift this time! By random selection, we’ve chosen the recipient of the first Tuttle book giveaway. Congratulations to ... mag11! There’s no language-learning challenge this week, but get ready for the next one soon so you can earn more points! Continue your language learning journey by heading over to Discussions to interact with fellow community members on interesting topics, such as “Basic words or sentences in your language” and “How often do you use your non-native language(s)?” Remember, you can earn up to 3 extra points each week by contributing quality comments to the Discussions page topics. * If you haven’t tried it out yet, give the One-Liner tool a shot to test your skills on writing and editing in different languages! 07/12/14--04:00: Which Drama Star Has the Most Kissable Lips? Don’t pretend like the thought hasn’t crossed your mind! As you’re watching your favorite dramas, sometimes you can’t help but notice the plump, juicy and ever-so-kissable lips of some of your favorite stars! Who can top Kim Soo Hyun and Gianna Jun’s kissable lips? We want to hear from you! Which star has the most kissable lips in your opinion? Let us know in the comments below and we’ll publish the results in an upcoming blog!